During the brutal times in which our adventure takes place the commandments were highly regarded however they were not always followed by the nobility, rather the opposite. Coveting thy neighbours house, wife, servants and household animals was the norm and the means through which they were acquired often broke the sixth commandment, Thou shalt not kill. Thankfully we are far away from those who know nothing about the commandments, as mentioned earlier, but we still have plenty of Christian neighbours who are all too eager to show us how much they value Christian love. Regardless of how much they may desire our holdings we must still do the decent thing and make our introductions. Let's start with the honourable count Angilbotto de la Tour du Pin of Venaissin. On our other side, to the east, lies the bishopric of Nice. This theocratic stronghold is ruled by Prince-Bishop Benedicto who rules with a lax hand. His paranoia has made him rather disliked in the area and together with his natural shyness this means he rarely leaves the monastery for neither invitations nor visitations. Like our neighbour to the west he is rather useless and ripe for being replaced by more prominent men. 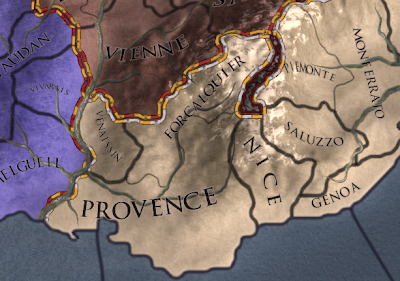 The rich lands of Genoa are in the hands of the comparatively competent Ansaldo. 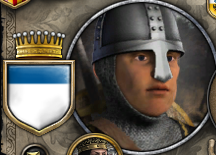 Of course, he doesn't have a drop of noble blood but our king moves in mysterious ways. If he wants a commoner to be in charge of one of the realms richest regions then that's his choice. As for me I shall plot to make them mine and mine alone. The Lord Mayor may have nearly all of the virtues, including diligence, charity and kindness, but that will not protect him from assassins or court intrigues. 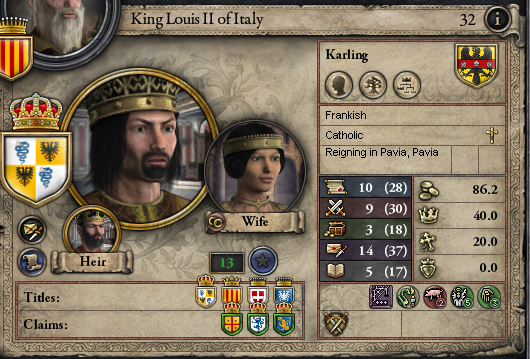 Having met our immediate neighbours there is one last person to introduce, one who technically already owns our holdings is the King, so please welcome the glorious King Louis II of Italy. 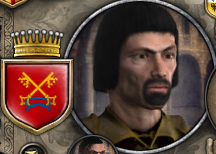 To answer the rhetorical question: I can tell you that you are the king,Louis II Karling. Your Royal Highness is, as you can see, a likeable master of intrigue with some ability when it comes to the field of battle but with little acumen, something reflected in his charitable nature. His patience serves him well in all his capacities, although his table manors can be somewhat uncouth as he tends to gobble anything in sight. 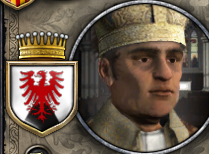 Being a part of the Karling dynasty Louis is involved in a complicated network of inheritances which all depend on who dies first and who manages to produce an heir before their time is up. Although our king is reasonably young his marriage to the queen has not yet yielded the hoped for results. Some say that this is because the king spends more time on the battlefield than in the bed chambers and this is supported by the fact that the king is at the moment involved in a war against the Muslims living at the "heel" of the Italian boot that is the subcontinent. We're not one of his favourite vassals at the moment but on the other hand there are others who are more disliked than our count Boson so we are not at risk of being named court jester. So those are the people living around us at the moment! Next time we will plan out our campaign.